Today we are featuring some research and writing carried out by Mrs Kirby of High Street, Market Lavington back in 1985 – the year the museum opened. 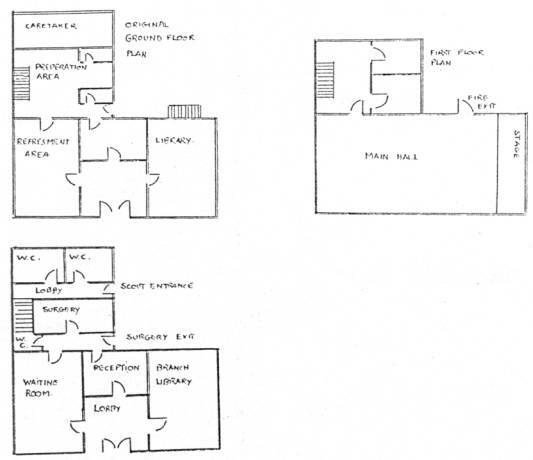 Mrs Kirby included a sketch of the hall and some floor plans. 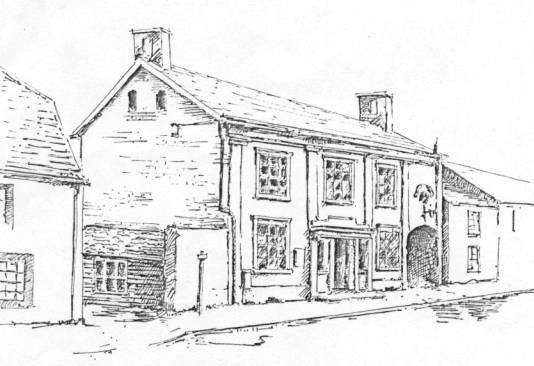 The Workmans’ Hall was built in 1865, financed by a legacy of £1000 (to be known as the Edward Saunders Temperance Fund) in the will of Edward Saunders , landowner and business man of the area and one time Councillor of the City of Bath, and Market Lavington. His wishes were executed by his brother Joseph. Edward a founder member of the Temperance League, enjoyed the comforts of his home, and his pipe dream was a place in Market Lavington where working men could be warm and comfortable, and so not be tempted to frequent the Inns in the village of which there were five. The building was to provide a meeting room, library, and reading room, well supplied with books and newspapers, a room for refreshment and also a small accommodation for a caretaker. The Workmans’ Hall was one of the first Temperance Halls in the country and here was started a Branch of the Independent Order of Rechabites, whose motto is “Truth and Temperance, love and Purity”. The membership was mostly Chapel. The front elevation is quite impressive, built of local brick, with stone pillars, and portico, five stone framed windows, an archway entrance to the rear, with clock over, and a bell tower. Strict regulations in the will regarding the conducting of the Hall made it difficult to run as a viable concern. Descendants of Edward helped both socially and with finance, but the membership dwindled. A local butcher, Mr. George Pike, with help, took matters in hand and installed billiard tables, introduced card games, dominoes and draughts, and refreshments. There were also “Pleasant Sunday Afternoons” when local talent entertained. Wives and children were allowed, and no doubt a good time was had by all, despite of or because of the off-key singing, duets and quartets and brass bands. The Temperance element was still active, and despite this effort the membership declined. The Hall was used by the Services during the war, and when released an attempt was made to run it in conjunction with the Parish Rooms opposite. This failed. In 1952 Rendells Ltd, builders, of Devizes started negotiations to purchase the Hall, which by then had deteriorated badly. On April 12th 1953 it became the property of Rendells and changed use. From 1953 to 1958 it seems it stood empty and unused. At this time the local Scout Group were without a Hall. In July 1958 they purchased from Rendells this almost derelict Hall, and change of use to a Scout Hall was granted. Since owning the Hall, the Scouts, generously helped by patrons, business people, friends, parents and the local councils, with interest free loans, gifts of money and kind and very essential hard labour, have been renovating the building. In 1977, there was a change of Trustees, and a new Community project was mooted. It was decided the Scout Hall should also be an Amenity for the people of Lavington. On September 7th 1985, 2nd Lavington Sea Scouts are putting on show their years of hard work. The Community project is almost finished and the Workmans’ Hall has thoroughly changed its use. It now houses the Doctors Surgery , The Community Library, all the Amenities the Sea Scouts need including a boat house, all ship-shape and Bristol fashion, a credit to all concerned. This building and its history have been conserved. This entry was posted on November 27, 2011 at 6:23 am and is filed under Museum. You can follow any responses to this entry through the RSS 2.0 feed. You can leave a response, or trackback from your own site.